Brewers often ask me which hop varieties to use for their home brewed beer recipes? The short answer is to use the variety that fits the style of beer you are brewing and also the one you enjoy the most! The longer answer is that you need to sample your hops – and using a hop tea is one of the best ways to do this. Rubbing and Smelling The Hops – The easiest method by far is to take a small sample of the hops you are considering and rub it in your hands. Then put your hands up to your nose and inhale deeply. You will get a good idea of the aroma the hop has. This will help you determine the hop aroma oils present in the variety, and is a good indicator of what you might get from dry hopping or whirlpool/steeping the hops. SMASH Brewing – Brewing beer with a Single Malt and Single Hops is another great way to get an idea of what a single hop variety brings to the beer. You can brew a mini-batch or full size batch using a Single (or two) malts and only one hop variety and it will provide a great indicator of how that hop performs in your beer. Hop Tea – The subject of this article – using a small sample of tea made with extract and your desired hop variety. This is probably the easiest way to get an idea of hop bitterness and boil flavor without brewing a full batch of beer. Plain Hop Tea with Cold Water: The most basic method, often used by non-brewers involves just water and tea. It can be made cold or hot. The cold infusion method uses more hops (approximately 1 oz (28 grams) per quart (liter) of water). Add the hops to cold water and allow to steep 4-8 hours at room temperature, then strain to remove the hops. At this point you can refrigerate it and drink when desired. This will give you a good idea of the hop flavor, but not how it interacts with malt or alcohol. Plain Hop Tea with Hot Water: Similar to above, but hot water is used to steep the hops for 20 minutes at a slightly lower hop rate. Generally you will get a slightly milder flavor from this method, along with some hop bitterness, but you still will not have an idea of how the hops, malt and alcohol interact. Hop Tea with Malt Extract: In this case, we will add some dry malt extract to our tea to give it a malty and hoppy flavor. Add approximately 2 ounces (57 grams) by weight to a quart (liter) of distilled or filtered water. This will give you a gravity of approximately 1.022. Next we’ll about 1/8 oz of hops, which will give a strong hop flavor, and boil it for 10 minutes. This will provide a pretty hoppy malt-hop tea we can taste and get a good idea of how the hop might perform. Hop Tea, Malt Extract and Alcohol: The final version – adds some alcohol to the mix. It won’t be beer, but will give you a good idea of how your hops will mix with both malt and alcohol flavors. In this case you make a hop tea with malt extract, just as described above. However after the quart/liter mixture cools, we mix in a small amount of clear 80 proof vodka. I recommend starting with 1 oz (29 ml) and adding a bit more as desired to balance the taste. Note that the above amounts are rough guidelines, and assume a moderate (6% alpha) hops, and assume a strongly hop forward mixture. 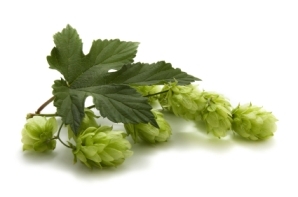 For high alpha hops, you probably will want to add less and for low alpha hops you may want to add more. You may need to play with the hop and alcohol content as well, or perhaps thin the mixture with water if it is too far out of balance when sampling. However the instructions above give you a good starting point to sample a hop variety without having to brew an entire batch of beer. Also note that hops are poisonous to dogs – so please don’t leave your unused or spent hops anywhere that your dog might get into them! The Grist: the Mad Fermentationist, Brad Smith, HomebrewDad, Jon Abernathy - Grizzly Bear Loves Kölsch.